Ozerlag. His father, who was also an active Zionist, died in the camp. Yosef was released in 1959 and eventually got to Israel in 1971.
and sentenced to 1.5 years in prison and 25 years of exile in Siberia. Blume Krieger, nee Jossel, b. 1873 (1928). your Vashki site, and also other sites you have for other places. Jerushalmy (nee Kruger) from Jerusalem ex Johannesburg South Africa. reference and genealogical table about the family Kriger-Jossel. from 1921)Mother of Blume Krieger . Oscher Krieger, b. 1870 (1928). Scheine, daughter of Jossel Jossel (1921). Zila, daughter of Oscher Krieger, b. 1899 picture from 1938. Moshe Joffe was born in Druja in 1897 to Srol and Chasa nee Movshe. He was a tanner and married to Nina. Prior to WWII he lived in Paris, France. During the war he was in Paris, France. Moshe perished in 1942 in Auschwitz, Camp at the age of 45. This information is based on a Page by his niece and nephew; Rosa and Charles Joffe. Grandma Nellie and Grandpa Charles with Esther, Sarah and Lena (the oldest). Sarah Slobodkin ( daughter of Chaim Schwartz and Hene nee Klien). Ahron Neta Gordin was born in Dagde, Latvia in 1870 to Moshe and Sara. He was married to Ester nee Astanovski. Prior to WWII he lived in Dagde, Latvia. During the war he was in Dagde, Latvia. Ahron was murdered in 1941 in Dagde, Latvia. This information is based on a Page of Testimony submitted by his son Moshe Gordin. Esther Gordin was born in Russia (USSR) in 1870 to Tana and Rachel. She was married to Aharon. Prior to WWII she lived in Dagde, Latvia. During the war she was in Dagde, Latvia. Esther was murdered in 1941 in Dagde, Latvia. This information is based on a Page of Testimony (displayed on left) submitted by her son. Etka Gordin was born in Riga, Latvia to Ben zion and Haya nee Lengetzint. She wasmurdered in 1941 in the Shoah. 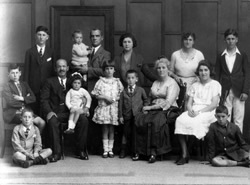 Children of Ben zion Gordin and Haya nee Lengetzint. of Riga. 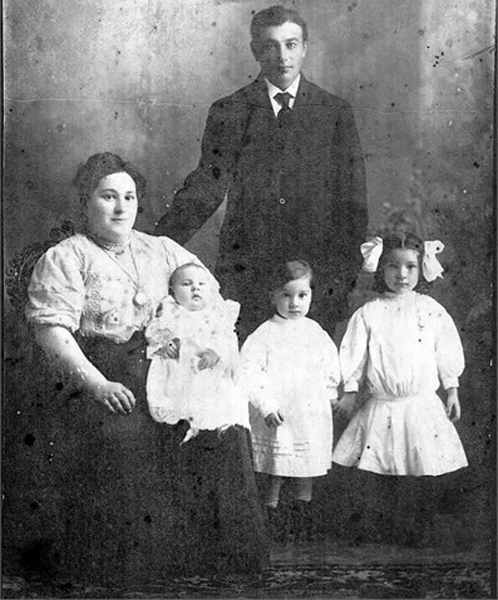 Amongst them from left: Moshe, Roza, Etka and Jacob who were murdered in 1941 in the Shoah. Roza Gordin was born in Riga, Latvia in 1911 to Ben zion and Riva nee Lengezint. She was a student and single. Prior to WWII she lived in Riga, Latvia. During the war she was in Riga, Latvia. Roza was murdered in 1941 in the Shoah at the age of 30. This information is based on a Page of Testimony submitted by her cousin Moshe Gordin, a Shoah survivor. Marina, daughter of Nahum and Anna-Nyuta Smargonski, was born in Riga, Latvia on 30 August 1938. During the war the family lived in Riga, and Marina perished in the Riga ghetto in December of 1941. She was 3 years old. Her father perished in a concentration camp in Germany. The photograph and Page of Testimony in her memory were submitted to Yad Vashem by Anna Yarshov (formerly Smargonski), Marina's mother. Elja Chait was born in Rezekne, Latvia. He was married to Sheine. Page of Testimony submitted by his relative. Isai Nekhom was born in Daugavpils, Latvia. He was a widower. Prior to WWII he lived in Riga, Latvia. During the war he was in Riga, Latvia. Isai was murdered in 1941 in Riga, Ghetto at the age of 60. This information is based on a Page of Testimony (displayed on left) submitted by his granddaughter Rokha. 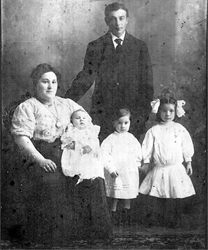 Shmuel Lulav was born in Riga to Tzila and Menachem Mendel in 1911. He passed away in Kibutz Afikim in 2006. 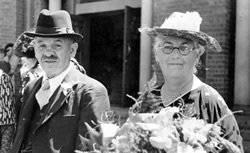 Sussman Leibowitsch and Pese nee Kahn. They perished in Latvia in 1941.
married to Mery nee Bunin. Father of ????? ??? and ?????? ????? Brother of ???? ???? and ???? ????? Yankel Trebukhov was born in Riga, Latvia in 1904 to Isaak and Khana. He was a soldier.. During the war he was in the Soviet armed forces. Yankel was killed in military service. Hirsh Trebukhov was born in Riga, Latvia in 1914 to Isaak and Khana. He was a metalworker. Prior to WWII he lived in Svisloch, Belorussia (USSR). During the war he was in the Soviet armed forces. Hirsh was killed in military service. Born in 1923 in Riga, Latvia, he was an activist from the age of 15 in the young halutzniks movement «HaNoar HaAgudati», a branch of the "Poalei Agudat Israel" party. ("Agudat Israel" - an international Zionist organization of orthodox Jews). He worked for the branch in his home city until the Soviet occupation. In 1940-41 he worked in the underground and spent the years 1941-45 in the Riga ghetto and in German concentration camps. In 1947 he was has arrested by the authorities on charges of his earlier Zionist activities and also for his attempt in 1946 to leave the Soviet Union illegally in order to get to Eretz Israel. He was sentenced to 5 years imprisonment in the Gulag plus 2 years exile. Released in 1953, he didn’t succeed in reaching Israel till 1969. He was a member of the Executive Committee and High Council of the Organization of Prisoners of Zion. He died in 1993. Born on 29th of July, 1924 in Riga, Latvia, he was 18 years old when he joined «HaShomer HaTzair» in his city, and was an active member of the movement before the Soviet occupation. Even after the occupation he continued his Zionist activities. He was arrested by the MGB twice: the first time in 1947 and the second time in 1950. Altogether he spent 8.5 years in prison. After being released in 1956, he still had to wait till 1971 before being allowed to emigrate to Israel. He died in 1992. This I believe is who we knew as "Ganyia" Meitin (son of Leova) who married Dahlia. They lived in Kfar Saba when they moved to Israel. They had two daughters who changed their names to Anat Meitin and Ronit Meitin. I don't remember their former names. The attached picture taken in Riga in the early 1960s, shows Uncle Leova standing with his wife. Ganyia in the middle looking down. My Uncle Louis Meitin in the front with the two girls who I mentioned. So Ganyia or Hannia is the son of Leova. Dora Khaiat was born in Latvia. Prior to WWII she lived in Riga, Latvia. During the war she was in Riga, Latvia. Dora was murdered in the Shoah. Šmuels Haits was born in 1876 to Hiršs. Prior to WWII he lived in Latvia. This information is based on a Personal documents found in Passport of Šmuels Idels Haits, born 30/07/1876, handed in to the police in Riga, Latvia, 1919 - 1940. Dora Bogdan nee Khait was born in Novoaleksandrovsk, Lithuania in 1899 to Khaim. She was a nachalnik proizvodstva and married to Aron. Prior to WWII she lived in Riga, Latvia. During the war she was in Riga, Latvia. Israel Chait was born in Riga, Latvia in 1893 to Philip and Chana. He was a violinist and married to Jacha nee Eliasstam. Prior to WWII he lived in Riga, Latvia. During the war he was in Riga, Ghetto. Israel was murdered in the Shoah. Jacha Chait nee Eliasstam was born in Riga, Latvia in 1890 to Elias. She was a cosmetician and married to Israel. Prior to WWII she lived in Riga, Latvia. During the war she was in Riga, Latvia. Jacha was murdered in the Shoah. Sheine Chait nee Gavartin was born in Vilion, Latvia to Shlome and Masia. She was married to Elja. Prior to WWII she lived in Riga, Latvia. During the war she was in Riga, Latvia. Sheine was murdered in the Shoah. Judel Hait was born in 1860. Prior to WWII he lived in Latvia. This information is based on a Personal documents found in Passport of Judels Haits, born 01/01/1860, handed in to the police in Riga, Latvia, 1919 - 1940. Son of Zvi Hirsh Gregory ??? Meitin ?????? and ???? Esther Meitin ?????? Father of Mendel Motel Meitin; Anichka Meitinand Chaya Anna Meitin ?????? Benjamin Bowschower was born in Riga, Latvia in 1896 to Mendel and Rocha nee Jawitsch. He was married to Jeva nee Meitin. Prior to WWII he lived in Riga, Latvia. During the war he was in Riga, Ghetto. Haja Rasa Prigoshansky (Sicherman) ? Share some things about Jacob Prigoshansky.